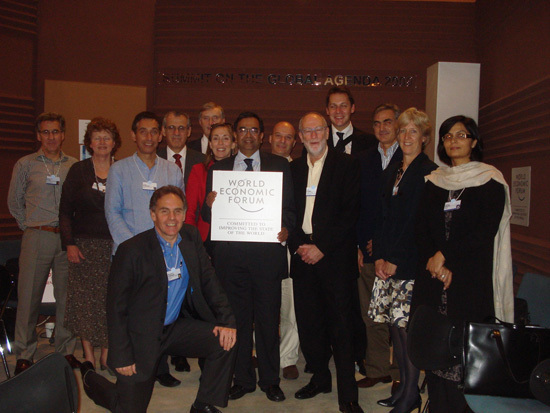 November 28, 2013: The Summit on the Global Agenda is the world’s largest brainstorming event, which annually convenes over 900 thought leaders from globally recognized expert communities for the World Economic Forum’s Network of Global Agenda Councils. This year, council members, including our President, Dr. Sania Nishtar met at the Global Agenda Summit in Abu Dhabi from November 18-20. The summit was hosted by the World Economic Forum in partnership with the Government of the United Arab Emirates. In recognition of the transformations that businesses, economies and societies are facing, members at this year’s Summit focused on ways of transforming new models into sustained processes in order to develop solutions for a greener and more socially inclusive world. November 27, 2013: Launched in Recife, Brazil, this month, the Bulletin of the World Health Organization was a themed issue with a focus on Universal Health Coverage. The launch was held to mark WHO’s Third Global Forum on Human Resource for Health and thus the theme of the issue was human resources for universal health coverage. Featuring twenty-five articles, the Bulletin explores the efforts, work plans, successful engagements and challenges in involving the human resource towards achieving universal health coverage. Our president, Dr. Sania Nishtar was a lead author with Johanna Ralston, World Heart Federation on the Bulletin’s paper: Can human resources for health in the context of non-communicable disease control be a lever for health system changes? November 27, 2013 The GAVI Alliance held its Board meeting in Cambodia on November 21-22, 2013 to identify the new vaccines to be added to the organization’s portfolio of support. The GAVI Alliance Board is intended to provide a platform for strategic direction and policy-making that will oversee the operations of the Alliance and monitor program implementation. At the occasion, our President, Dr. Sania Nishtar presented the Committee Chair Report as the Evaluation Advisory Committee Chair. The Board Meeting this year was featured by Cambodia’s Prime Minister, Hun Sen, representatives from donor and developing countries, civil society organizations, vaccine manufacturers and other stakeholders in global immunization. The minutes can be accessed here. November 13, 2013: Over the years, the Woodrow Wilson International Center for Scholars has developed a strong brand for publications on Pakistan. 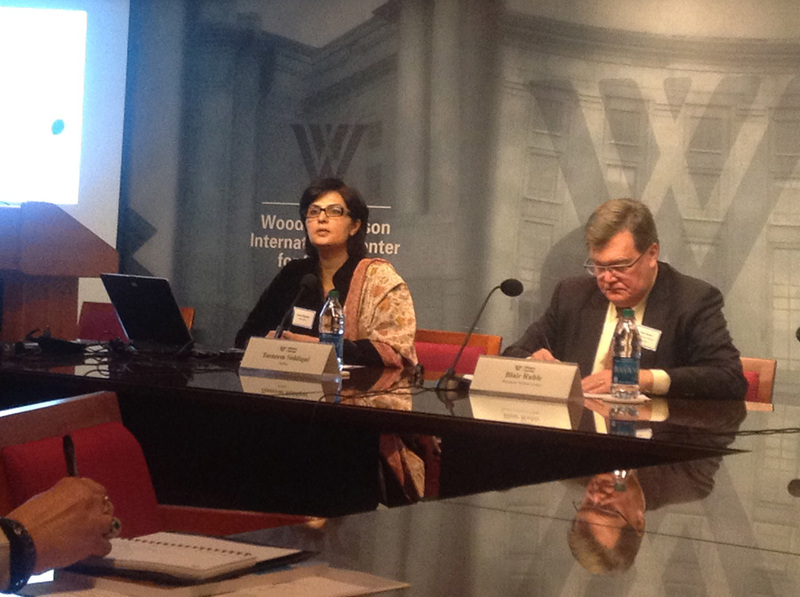 On November 6th, 2013, through its Asia Program and Comparative Urban Studies Project and the Fellowship Fund for Pakistan, the Center held its latest conference, Pakistan’s Galloping Urbanization in Washington DC. Hosted by Robert Hathaway and Michael Kugleman, the seminar invited eminent Pakistani scholars including our President, Dr. Sania Nishtar who presented her paper on Urbanization and Public Health. The Center will publish her findings in its subsequent volume on urbanization in Pakistan, which will be a compendium of research contributions by the scholars present at the conference, including Mohammad Qadeer, Tasneem Siddiqui, Murtaza Haider, Nadeem Ul Haque, Ahsan Iqbal, Aun Rahman and Nadeem Hussain. November 12, 2013: The disease burden of non-communicable diseases (NCDs) is exceptionally high in the developing world with 80% of deaths caused by NCDs occurring in low and middle income countries alone. Within that context, the John Hopkins University press has recently released a new book, titled Noncommunicable Diseases in the Developing World: Closing the gap. Edited by Jeffrey L. Sturchio and Louis Galambos, the book features several chapters by NCD experts that seek to provide the reader with recommendations and actions based on the authors’ experiences and their review of the NCD situation in the developing world. One of these chapters, “Sectoral Cooperation for the Prevention and Control of NCDs” was co-authored by our President, Dr. Sania Nishtar and Sir George Alleyne. Earlier last month, the Supreme Court directed the government to put in place the necessary institutional arrangements at the Pakistan Telecommunication Authority, in particular hiring of the three members central to the governance of this regulatory body, so that the long awaited 3G spectrum and licence auction could be expedited. In compliance a number of steps were taken by the government. However, the premise of the public policy discourse on 3G centres on the notion that the auction will yield revenue in foreign exchange, badly needed to offset part of the budgetary deficit. 3G should not, however, be as just a revenue-raising option; it has potential for much broader impact through its correlation with economic growth and development. As opposed to 2G technology, 3G enables better data usage and video content viewing because of the increased speed of mobile internet, not previously available to mobile-phone users. This is not a ‘good-to-have’ luxury but has important implications for economic growth, human development, and governance. According to the World Economic Forum’s Global Information Technology Report 2013, for a given level of mobile penetration, a 10 percent increase in 3G penetration increases GDP per-capita growth by 0.15 percentage points and a doubling of mobile data use is associated with an increase in the GDP per-capita growth rate of 0.5 percentage points. The same report also outlines the benefits of digitisation, a process which can be facilitated by 3G, and the mass adoption of which can benefit both public and private sectors. A 10 percent increase in the country’s digitisation score drives a 0.75 percent growth in its GDP per capita. Although these projections, which assume that the necessary enablers to fully reap 3G’s benefits are in place, may not strictly apply in Pakistan’s setting, they nonetheless offer instructive evidence with respect to 3G’s overall potential. Even with the existing constraints, 3G’s capabilities, its data transfer speed-enhancing and digitisation-enabling features can facilitate both governance as well as service delivery especially when seen in context of the country’s rapidly evolving ‘mobile money’ (money) capabilities. For example, the emphasis on transparency, targeting and effectiveness in government-to-people payments, rightly being espoused by many development partners, alone can benefit millions of people. 3G technology is available in 160 countries of the world, including even the less developed neighbouring Afghanistan. However, in Pakistan its auction has been impeded by legal and governance impediments since 2007. To begin with, a seven-year moratorium on the entry of new operators, which was part of the Pakistan Telecommunication Company Limited’s privatisation agreement, was the basis of the decision not to auction the spectrum in that time frame as it would have increased competition at the time when Etisalat had just made an investment to purchase PTCL. The moratorium lifted in March 2013 but in the run-up to that, governance issues at the Pakistan Telecommunication Authority, the agency responsible for the auction, have been the impediment. Problems existed both at the policy ‘process’ level as well its implementation. PTA is the telecom sector regulator, and rightly so, it is at an arms-length from the sector policymaking entity, the Ministry of Information Technology (MoIT). In 2011, MoIT had issued a policy directive asking PTA to proceed with the auction but problems with policy implementation resulted in a major deadlock which ultimately paralysed governance within the organisation. It was ironic that the regulator of the largest industry in Pakistan was completely non-functional for at least seven months. Deadlocks over appointments lurched the process from one stay order to another, as a consequence of which functionaries within PTA endured significant hardship and several policy processes including 3G auction, stood still. The delay in the 3G auction alone has incurred a massive loss to the economy in terms of opportunity. Most recently, the incumbent government has issued a policy directive to proceed with the auction and has resolved some of the issues at PTA. However, it remains to be seen if the auction will generate the expected level of interest given the emergence of newer technologies, which are leading consumers to use wireless broadband, or ‘hot spots’, rather than mobile networks for data. This notwithstanding, transparency and conformity with stipulated rules could be the winning ingredient in this auction, relatively speaking. There is another legal complexity in the process of the auction, which hasn’t featured well in public debate yet. According to the Telecom Deregulation Act 2004 (Act), proceeds of the 3G ‘Spectrum’ auction are meant to be channelled into the Universal Service Fund (USF), a Section 42 company, which pools 1.5 percent of the net profits of mobile cellular operators. This Act permits ‘licence fees’ to be collected by the government though. Governance issues notwithstanding, the USF has a very important mandate – providing subsidies to telecom operators for provision of connectivity to Pakistan’s underserved and remote areas. If appropriately harnessed, this could be truly transformative for bridging the digital divide, opening avenues for mainstreaming these remote areas in the formal economy and helping deliver health and education services to the underserved. The government has already withdrawn part of the USF’s exiting funds through an executive order; the role of the USF’s ‘autonomous’ board in this decision remains unknown. It also appears that by opting to auction the ‘spectrum licences’, the government plans to deposit the auction fees into its consolidated fund since the Act permits the licence fees to be collected by the government. However, according to the Act, the spectrum auction money has to go to the USF and it seems logical to assume that in order to use the auction proceeds for any purpose other than the one for which the law stipulates its use, an amendment to the law would be necessary. It will be interesting to see how parliamentary proceedings on the amendment to the law pan out since a verdict on this would be reflective of parliamentarians’ capacity, level of engagement and ability to influence decisions. It would be unfortunate to dismantle a system with strategic potential just because we have to pay for the inefficiencies of past governments and/or finance tactical interventions. This will be a test of the robustness of parliamentary proceedings, their actual role in key decisions, their ability to appreciate the difference between strategy and tactics and their outlook towards nation-building as opposed to short-term political gains.